What Color Effects Do You Want to Achieve? 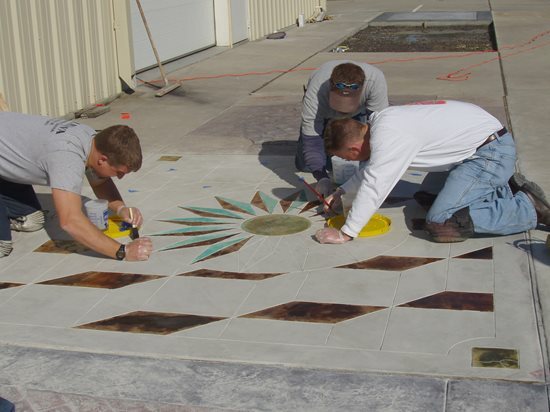 Decorative concrete training classes are a great way to learn what can be done with stains and dyes. 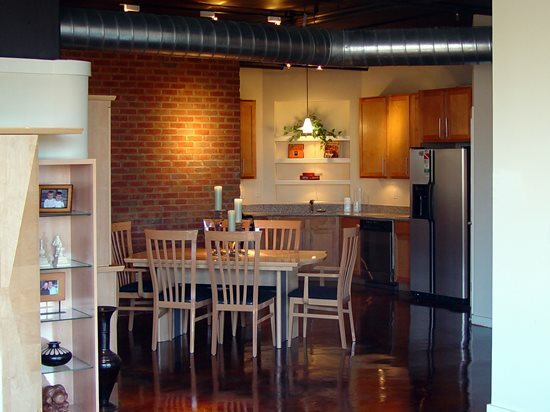 Decorative Concrete Institute in Temple, GA. Deeper color effects can be achieved by mixing two or more stain colors before application or applying one color over another. Decorative Concrete Institute in Temple, GA.
Of course, this will be your most important consideration, equal in priority to the decision a painter makes when choosing between water colors, acrylics, or oil-based paints, knowing that each will impart color to the bare canvas but with strikingly different results. With acid-based chemical stains, wide color variations are normal. Surfaces will have a mottled, variegated appearance, and the variations will be emphasized when a clear sealer is applied. Some acid stain colors are deceiving in liquid form. For example, a stain may look dark green in its container but will take on its actual color (such as a reddish brown) after it has reacted with the concrete surface. The stain may not reveal its true color until it has been allowed to remain on the concrete for several hours or longer. Although acid stains are available in limited color selections, you can mix two or more stain colors before application to achieve a different shade or apply one color over another. You can also produce deeper color effects with a stain by making two applications. Water-based stains can also be mixed to achieve custom hues and often are used in conjunction with acid stains to add highlights or expand the color palette. But be sure to check with the manufacturer for compatibility. Most dyes are packaged in concentrated form (either as a liquid or powder, depending on the product), allowing flexibility in the end color. They can be used full strength to attain greater depth of color or diluted with water or solvents to produce paler shades or simply a light wash of color. You can also blend different colors of dye to produce custom hues. If you'd rather not experiment with mixing different colors of stains or dyes, many manufacturers will offer custom color matching for an additional fee.